First "Condotta" for the Jews. The Inquisition and Hebrew Literature. The Republic Becomes a Democracy. Equality of Jews and Christians Established. Italian city; formerly capital of a republic embracing northeastern Italy and some islands in the Mediterranean. The first Venetian document, so far as known, in which Jews are mentioned is a decree of the Senate, dated 945, prohibiting captains of ships sailing in Oriental waters from taking on board Jews or other merchants—a protectionist measure which was hardly ever enforced. According to a census of the city said to have been taken in 1152 (Galliccioli, "Memoria Antiche Venete," ii. 279), the Jews then in Venice numbered 1,300, an estimate which Galliccioli himself believes to be excessive. An event which must have increased the number of Jews in Venice was the conquest of Constantinople by the allied Venetians and French in 1204, when the former took possession of several islands in the Levant, including Eubœa, where the Jews were numerous. At that time Jewish merchants went to Venice for the transaction of business, and some of them settled there permanently. The first lasting settlement of Jews was not in the city itself, but on the neighboring island of Spinalunga, which was called "Giudeca" in a document dated 1252. For some unknown reason this island was afterward abandoned. For several centuries the ruins of two ancient synagogues were to be seen there (comp. Ravà in "Educatore Israelità," 1871, p. 47). At the beginning of the thirteenth century many Jews went to Venice from Germany, some seeking refuge from persecution, others attracted by the commercial advantages of this important seaport. A decree of the Senate, dated 1290, imposed upon the Jews of Venice a duty of 5 per cent on both imports and exports (Galliccioli, l.c. ii. 280). R. Simeon Luzzatto (1580-1663) speaks in his noteworthy "Discorso Circa il Stato degli Hebrei di Venetia" (p. 18) of the Jew who was instrumental in bringing the commerce of the Levant to Venice. An ordinance of 1541, issued by the Senate on the advice of the Board of Commerce, to provide Jewish merchants with storehouses within the precincts of the ghetto, observes that "the greater part of the commerce coming from Upper and Lower Rumania is controlled by itinerant Jewish Levantine merchants" (Schiavi, "Gli Ebrei in Venezia e nelle Sue Colonie," p. 493). When the "Cattaveri" were commissioned in 1688 to compile new laws for the Jews, the Senate demanded that "the utmost encouragement possible should be given to those nations [referring to the various sections into which the whole Jewish community was divided] for the sake of the important advantages which will thus accrue to our customs duties" (comp. Ravà, l.c. 1871, p. 334). Besides engaging in commerce, the Jews conducted loan-banks; and in the ancient decrees of the Senate in regard to them it is repeatedly declared that the operation of these banks, which was prohibited by the canonical law, was the chief reason for admitting Jews into Venice. Therefore, in deference to some remnant of scruple, it was ordained, at least at first, that contracts relative to these transactions should not be drawn up in the city itself, but in the neighboring Mestre (Galliccioli, l.c. ii. 281). The interest on the loans was at first fixed by a decree of 1366 at 4 per cent, but it was raised afterward to 10 or 12 per cent, according to whether the loans were made on substantial security or on written obligations. The original object of these banks was solely to help the poor, but it soon became evident that it was necessary to provide for greater loans, some of which were made to the government itself. These banks, as well as Jewish affairs in general, were placed under the surveillance of special magistrates whose titles varied according to the times, as "consoli," "sopraconsoli," "provveditori," "sopraprovveditori," etc. 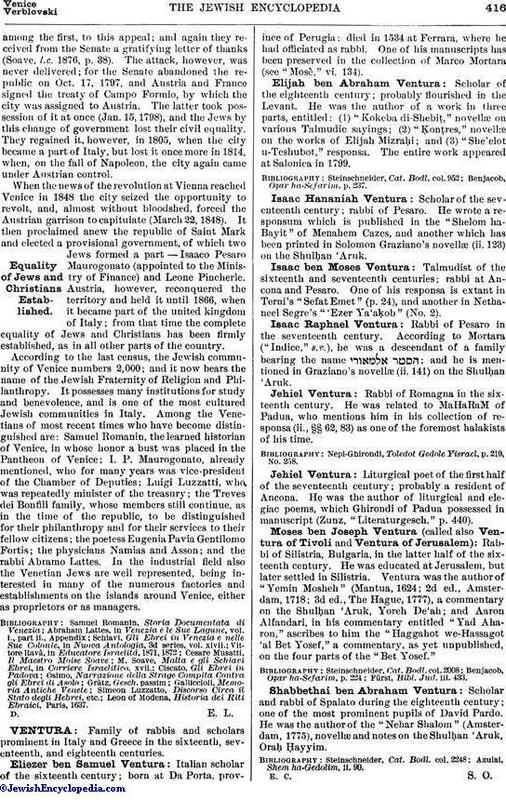 (see Soave in "Corriere Israelitico," 1879, p. 56). Plan of Venice in 1640. Star Shows Position of the Ghetto. 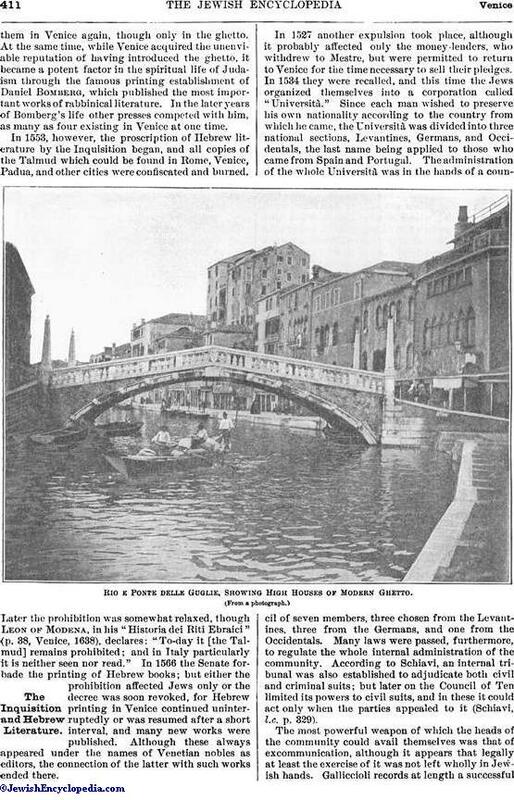 Despite all this, however, the right of the Jews to reside in Venice always remained precarious. Their legal position was not regulated by law, but was determined, as in the case of other foreign colonies, by "condotte" (safe-conducts) granted for terms of years, and the renewal of which was sometimes refused (Lattes, in "Venezia e le Sue Lagune," vol. i., p. ii., Appendix, p. 177). The Jews, indeed, were twice expelled and compelled to retire to Mestre. 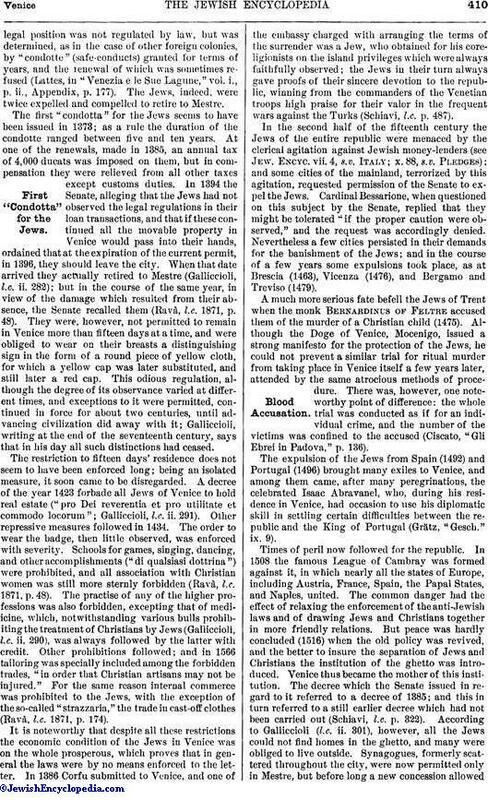 The first "condotta" for the Jews seems to have been issued in 1373; as a rule the duration of the condotte ranged between five and ten years. At one of the renewals, made in 1385, an annual tax of 4,000 ducats was imposed on them, but in compensation they were relieved from all other taxes except customs duties. In 1394 the Senate, alleging that the Jews had not observed the legal regulations in their loan transactions, and that if these continued all the movable property in Venice would pass into their hands, ordained that at the expiration of the current permit, in 1396, they should leave the city. When that date arrived they actually retired to Mestre (Galliccioli, l.c. ii. 282); but in the course of the same year, in view of the damage which resulted from their absence, the Senate recalled them (Ravà, l.c. 1871, p. 48). They were, however, not permitted to remain in Venice more than fifteen days at a time, and were obliged to wear on their breasts a distinguishing sign in the form of a round piece of yellow cloth, for which a yellow cap was later substituted, and still later a red cap. This odious regulation, although the degree of its observance varied at different times, and exceptions to it were permitted, continued in force for about two centuries, until advancing civilization did away with it; Galliccioli, writing at the end of the seventeenth century, says that in his day all such distinctions had ceased. The restriction to fifteen days' residence does not seem to have been enforced long; being an isolated measure, it soon came to be disregarded. A decree of the year 1423 forbade all Jews of Venice to hold real estate ("pro Dei reverentia et pro utilitate et commodo locorum"; Galliccioli, l.c. ii. 291). Other repressive measures followed in 1434. The order to wear the badge, then little observed, was enforced with severity. Schools for games, singing, dancing, and other accomplishments ("di qualsiasi dottrina") were prohibited, and all association with Christian women was still more sternly forbidden (Ravà, l.c. 1871, p. 48). The practise of any of the higher professions was also forbidden, excepting that of mediicine, which, notwithstanding various bulls prohibiting the treatment of Christians by Jews (Galliccioli, l.c. ii. 290), was always followed by the latter with credit. Other prohibitions followed; and in 1566 tailoring was specially included among the forbidden trades, "in order that Christian artisans may not be injured." For the same reason internal commerce was prohibited to the Jews, with the exception of the so-called "strazzaria," the trade in cast-off clothes (Ravà, l.c. 1871, p. 174). It is noteworthy that despite all these restrictions the economic condition of the Jews in Venice was on the whole prosperous, which proves that in general the laws were by no means enforced to the letter. 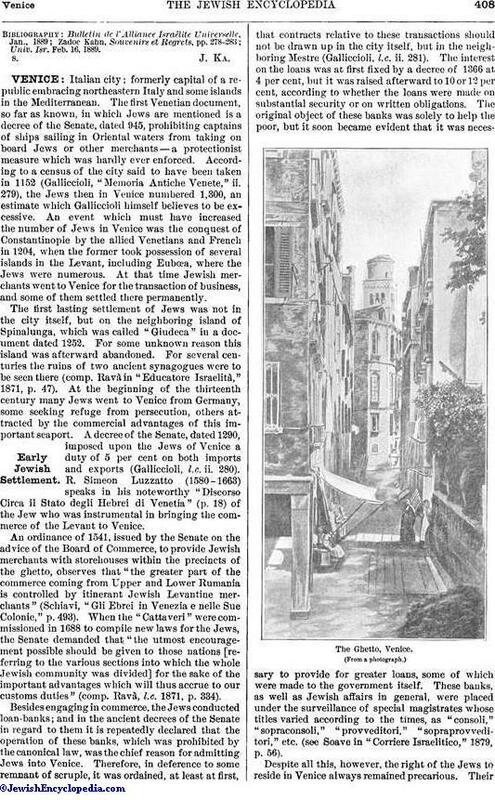 In 1386 Corfu submitted to Venice, and one of the embassy charged with arranging the terms of the surrender was a Jew, who obtained for his coreligionists on the island privileges which were always faithfully observed; the Jews in their turn always gave proofs of their sincere devotion to the republic, winning from the commanders of the Venetian troops high praise for their valor in the frequent wars against the Turks (Schiavi, l.c. p. 487). 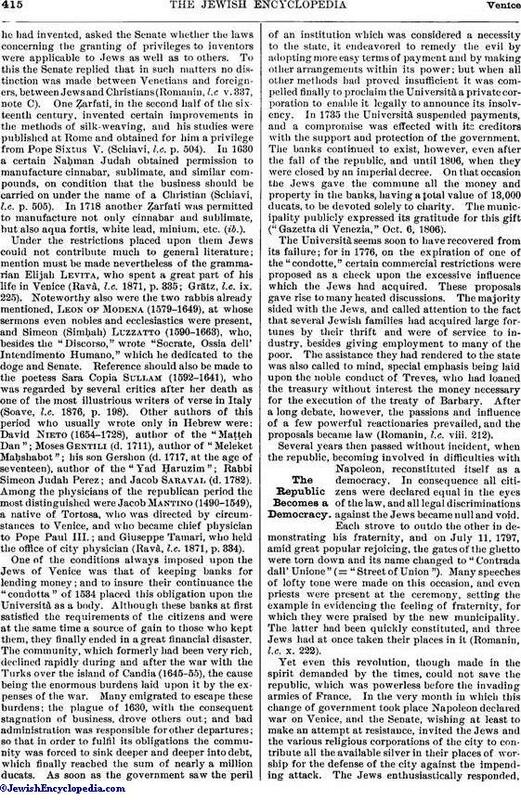 In the second half of the fifteenth century the Jews of the entire republic were menaced by the clerical agitation against Jewish money-lenders (see Jew. Encyc. vii. 4, s.v. Italy; x. 88, s.v. Pledges); and some cities of the mainland, terrorized by this agitation, requested permission of the Senate to expel the Jews. Cardinal Bessarione, when questioned on this subject by the Senate, replied that they might be tolerated "if the proper caution were observed," and the request was accordingly denied. Nevertheless a few cities persisted in their demands for the banishment of the Jews; and in the course of a few years some expulsions took place, as at Brescia (1463), Vicenza (1476), and Bergamo and Treviso (1479). A much more serious fate befell the Jews of Trent when the monk Bernardinus of Feltre accused them of the murder of a Christian child (1475). Although the Doge of Venice, Mocenigo, issued a strong manifesto for the protection of the Jews, he could not prevent a similar trial for ritual murder from taking place in Venice itself a few years later, attended by the same atrocious methods of procedure. There was, however, one noteworthy point of difference: the whole trial was conducted as if for an individual crime, and the number of the victims was confined to the accused (Ciscato, "Gli Ebrei in Padova," p. 136). The expulsion of the Jews from Spain (1492) and Portugal (1496) brought many exiles to Venice, and among them came, after many peregrinations, the celebrated Isaac Abravanel, who, during his residence in Venice, had occasion to use his diplomatic skill in settling certain difficulties between the republic and the King of Portugal (Grätz, "Gesch." ix. 9). Times of peril now followed for the republic. In 1508 the famous League of Cambray was formed against it, in which nearly all the states of Europe, including Austria, France, Spain, the Papal States, and Naples, united. The common danger had the effect of relaxing the enforcement of the anti-Jewish laws and of drawing Jews and Christians together in more friendly relations. But peace was hardly concluded (1516) when the old policy was revived, and the better to insure the separation of Jews and Christians the institution of the ghetto was introduced. Venice thus became the mother of this institution. The decree which the Senate issued in regard to it referred to a decree of 1385; and this in turn referred to a still earlier decree which had not been carried out (Schiavi, l.c. p. 322). According to Galliccioli (l.c. ii. 301), however, all the Jews could not find homes in the ghetto, and many were obliged to live outside. 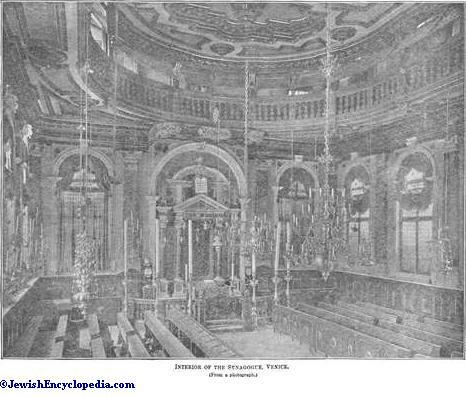 Synagogues, formerly scattered throughout the city, were now permitted only in Mestre, but before long a new concession allowedthem in Venice again, though only in the ghetto. 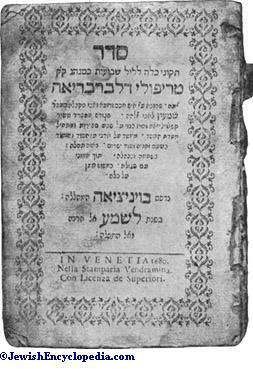 At the same time, while Venice acquired the unenviable reputation of having introduced the ghetto, it became a potent factor in the spiritual life of Judaism through the famous printing establishment of Daniel Bomberg, which published the most important works of rabbinical literature. In the later years of Bomberg's life other presses competed with him, as many as four existing in Venice at one time. In 1553, however, the proscription of Hebrew literature by the Inquisition began, and all copies of the Talmud which could be found in Rome, Venice, Padua, and other cities were confiscated and burned. Later the prohibition was somewhat relaxed, though Leon of Modena, in his "Historia dei Riti Ebraici" (p. 38, Venice, 1638), declares: "To-day it [the Talmud] remains prohibited; and in Italy particularly it is neither seen nor read." In 1566 the Senate forbade the printing of Hebrew books; but either the prohibition affected Jews only or the decree was soon revoked, for Hebrew printing in Venice continued uninterruptedly or was resumed after a short interval, and many new works were published. Although these always appeared under the names of Venetian nobles as editors, the connection of the latter with such works ended there. In 1527 another expulsion took place, although it probably affected only the money-lenders, who withdrew to Mestre, but were permitted to return to Venice for the time necessary to sell their pledges. In 1534 they were recalled, and this time the Jews organized themselves into a corporation called "Università." Since each man wished to preserve his own nationality according to the country from which he came, the Università was divided into three national sections, Levantines, Germans, and Occidentals, the last name being applied to those who came from Spain and Portugal. The administration of the whole Università was in the hands of a council of seven members, three chosen from the Levantines, three from the Germans, and one from the Occidentals. Many laws were passed, furthermore, to regulate the whole internal administration of the community. According to Schiavi, an internal tribunal was also established to adjudicate both civil and criminal suits; but later on the Council of Ten limited its powers to civil suits, and in these it could act only when the parties appealed to it (Schiavi, l.c. p. 329). 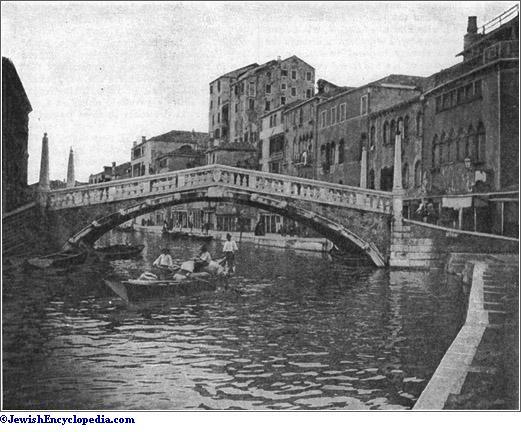 Rio e Ponte delle Guglie, Showing High Houses of Modern Ghetto. The most powerful weapon of which the heads of the community could avail themselves was that of excommunication, although it appears that legally at least the exercise of it was not left wholly in Jewish hands. Galliccioli records at length a successfulappeal presented to the Patriarch of Venice by the heads of the Università, for permission to excommunicate those living in the ghetto who neglected their religious duties; and the author adds that the right to give this authority had been in the hands of the patriarch until 1671, when it passed to the "Cattaveri" (Galliccioli, l.c. ii. 301). It does not appear, however, from any subsequent documents that the Jews held strictly to this dependence. Schools for study were naturally among the most important institutions of Jewish life in Venice at all times. In addition to Hebrew, secular branches of study were taught in them (Schiavi, l.c. p. 332). 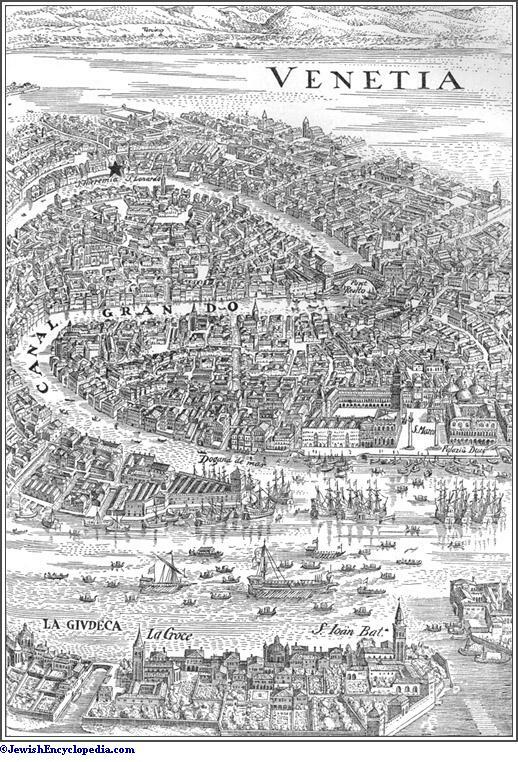 Although nominally restricted to the ghetto, the Jews lived in general throughout the city, and in the sixteenth century, when the vice of gambling raged in Venice, the ghetto also was infected, while Jews and Christians often played together. Although the government had already imposed penalties upon gambling, the heads of the Università saw that the measure remained ineffective, and they therefore pronounced excommunications in the synagogue against those who played certain games. Excommunication failed in its turn; and Leon of Modena, whose reputation was seriously stained because of his addiction to this vice, wrote a long protest against his own excommunication, which he declared illegal; the ban, he said, only drove people to worse sins. In all his long discussion there is no sign of the fact that the pronouncing of the excommunication was dependent on any but the Jews themselves. It appears from the disquisition of Leon of Modena that the number of Jews then in Venice was little more than 2,000. This agrees with other data of the time, so that it seems necessary to reject the number 6,000 given for that period in Luzzatto's "Discorso Circa il Stato degli Hebrei di Venetia." In 1659, according to an official census, their number had increased to 4,860 (Schiavi, l.c. p. 507). The struggle against gaming continued, and, in addition, regulations intended to check unnecessary luxury in dress and excessive display in banquets and family festivals were repeatedly published in the synagogue. Among the various societies of the period there was in Venice, as probably in the majority of Jewish communities, one for the ransom of Jews who had been enslaved. 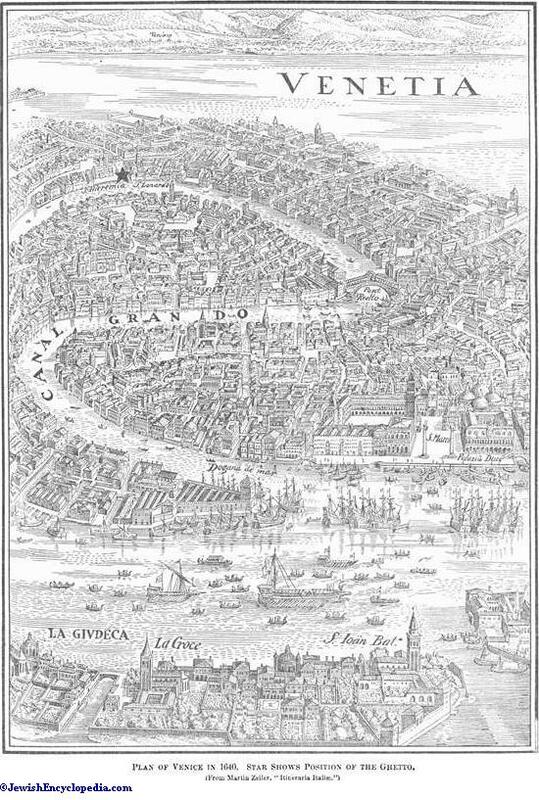 Venice and Amsterdam were the two principal centers for the relief of such unfortunates, and consequently the societies of other communities as a rule made their headquarters in these two cities. Venice and Amsterdam, by mutual consent, divided the field of their activities. On the former devolved the task of effecting the ransom of those Jews who had sailed in Turkish ships from Constantinople and other Oriental ports, and had fallen into the hands of the Knights of St. John, who waged a fierce and continual warfare against such ships. The Jews taken captive in these frequent attacks were held in Malta in hope of a heavy ransom, and were most barbarously treated. The society at Venice had a permanent Christian delegate on the island, with the recognized title of consul, whose duty it was to alleviate the lot of the wretched captives as far as possible and to conduct negotiations for their ransom (Soave, "Malta e gli Schiavi Ebrei," in "Corriere Israelitico," xvii. 54 et seq.). In 1571, after the battle of Lepanto, in which the Venetians and Spaniards conquered the Turks in the contest for the island of Cyprus, the danger of expulsion again threatened the Jews of Venice. During this war much ill feeling had arisen in Venice against the Jews because one of their coreligionists, Joseph Nasi, was said to have suggested the war, and many Venetians suspected that the Jews of the city had sympathized with him. 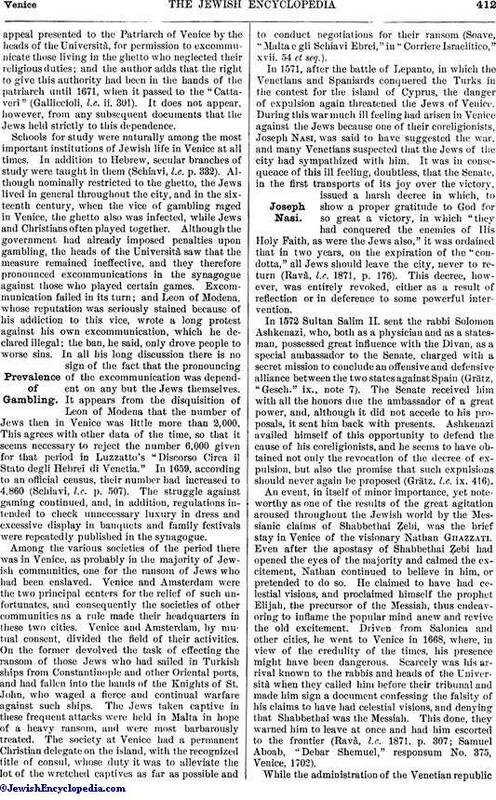 It was in consequence of this ill feeling, doubtless, that the Senate, in the first transports of its joy over the victory, issued a harsh decree in which, to show a proper gratitude to God for so great a victory, in which "they had conquered the enemies of His Holy Faith, as were the Jews also," it was ordained that in two years, on the expiration of the "condotta," all Jews should leave the city, never to return (Ravà, l.c. 1871, p. 176). This decree, however, was entirely revoked, either as a result of reflection or in deference to some powerful intervention. In 1572 Sultan Salim II. sent the rabbi Solomon Ashkenazi, who, both as a physician and as a statesman, possessed great influence with the Divan, as a special ambassador to the Senate, charged with a secret mission to conclude an offensive and defensive alliance between the two states against Spain (Grätz, "Gesch." ix., note 7). The Senate received him with all the honors due the ambassador of a great power, and, although it did not accede to his proposals, it sent him back with presents. Ashkenazi availed himself of this opportunity to defend the cause of his coreligionists, and he seems to have obtained not only the revocation of the decree of expulsion, but also the promise that such expulsions should never again be proposed (Grätz, l.c. ix. 416). An event, in itself of minor importance, yet noteworthy as one of the results of the great agitation aroused throughout the Jewish world by the Messianic claims of Shabbethai Ẓebi, was the brief stay in Venice of the visionary Nathan Ghazzati. Even after the apostasy of Shabbethai Ẓebi had opened the eyes of the majority and calmed the excitement, Nathan continued to believe in him, or pretended to do so. He claimed to have had celestial visions, and proclaimed himself the prophet Elijah, the precursor of the Messiah, thus endeavoring to inflame the popular mind anew and revive the old excitement. Driven from Salonica and other cities, he went to Venice in 1668, where, in view of the credulity of the times, his presence might have been dangerous. Scarcely was his arrival known to the rabbis and heads of the Università when they called him before their tribunal and made him sign a document confessing the falsity of his claims to have had celestial visions, and denying that Shabbethai was the Messiah. This done, they warned him to leave at once and had him escorted to the frontier (Ravà, l.c. 1871, p. 307; Samuel Aboab, "Debar Shemuel," responsum No. 375, Venice, 1702). 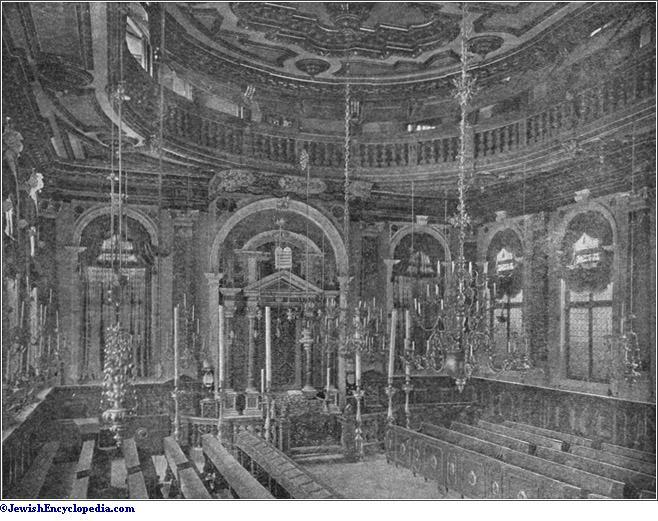 Interior of the Synagogue, Venice. While the administration of the Venetian republic was always under papal influence, a spirit of comparative tolerance prevailed there, as is usual in maritime and commercial cities, and the Jews, like all others, were free from restrictions in their worship. Well organized and strong, the republic always maintained order and fulfilled its compacts faithfully. The "condotte" were religiously observed, and the lives and property of Jews were protected. Local outbreaks against the Jews were of rare occurrence and were quickly followed by exemplary punishments (Osimo, "Narrazione della Strage Compita Contra gli Ebrei d' Asolo," Padua, 1875). The Inquisition existed at Venice, although it was not admitted until 1279, after long opposition; but its jurisdiction extended only over Christian heretics, and even over them its power was much restricted. In 1570 the inquisitors of Padua wished to compel the Jews to attend sermons in their churches. On this occasion the Senate recalled them to their proper province, but it appears that they succeeded at some later time, for the greater part of a sermon which was preached to the Jews in one of the churches in Padua in 1715 is still preserved (Ciscato, l.c. pp. 140-141). At all events, continual contact in daily life often led naturally to friendly relations between Jews and Christians, and the government was enlightened enough to encourage them. In 1553 the council granted Kalonymus, a Jewish physician, the means necessary to keep his son at his studies, "so that he may become a man useful in the service of this illustrious city" (Romanin, "Storia Documentata di Venezia," v. 337, note 3). In the great financial stress in which the republic was placed during the long and expensive war with the Turks the Jews were obliged to pay heavy taxes. Nevertheless, their contributions, like those of the other citizens, were often spontaneous; and the names of the bankers Anselmo and Abramo, who had voluntarily contributed 1,000 ducats, with those of other contributors, were inscribed in a book of parchment "in everlasting remembrance" (Schiavi, l.c. p. 320). 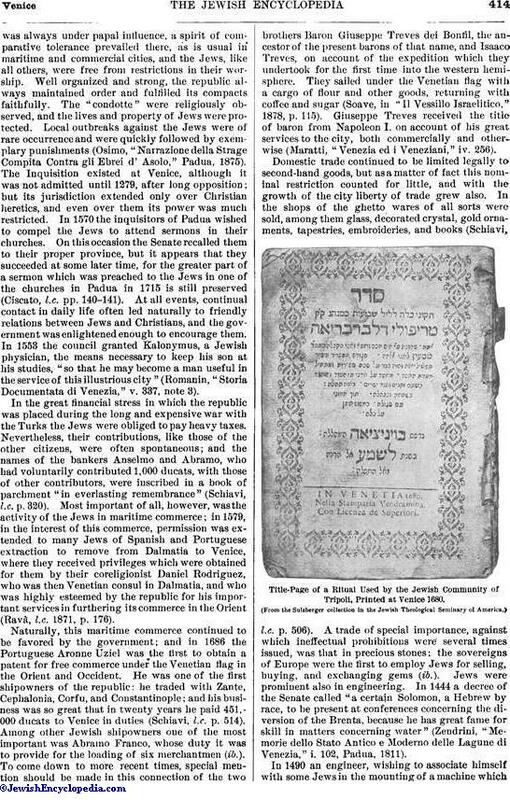 Most important of all, however, was the activity of the Jews in maritime commerce; in 1579, in the interest of this commerce, permission was extended to many Jews of Spanish and Portuguese extraction to remove from Dalmatia to Venice, where they received privileges which were obtained for them by their coreligionist Daniel Rodriguez, who was then Venetian consul in Dalmatia, and who was highly esteemed by the republic for his important services in furthering its commerce in the Orient (Ravà, l.c. 1871, p. 176). Naturally, this maritime commerce continued to be favored by the government; and in 1686 the Portuguese Aronne Uziel was the first to obtain a patent for free commerce under the Venetian flag in the Orient and Occident. He was one of the first shipowners of the republic: he traded with Zante, Cephalonia, Corfu, and Constantinople; and his business was so great that in twenty years he paid 451,000 ducats to Venice in duties (Schiavi, l.c. p. 514). Among other Jewish shipowners one of the most important was Abramo Franco, whose duty it was to provide for the loading of six merchantmen (ib.). To come down to more recent times, special mention should be made in this connection of the two brothers Baron Giuseppe Treves dei Bonfil, the ancestor of the present barons of that name, and Isaaco Treves, on account of the expedition which they undertook for the first time into the western hemisphere. They sailed under the Venetian flag with a cargo of flour and other goods, returning with coffee and sugar (Soave, in "Il Vessillo Israelitico," 1878, p. 115). Giuseppe Treves received the title of baron from Napoleon I. on account of his great services to the city, both commercially and otherwise (Maratti, "Venezia ed i Veneziani," iv. 256). Domestic trade continued to be limited legally to second-hand goods, but as a matter of fact this nominal restriction counted for little, and with the growth of the city liberty of trade grew also. In the shops of the ghetto wares of all sorts were sold, among them glass, decorated crystal, gold ornaments, tapestries, embroideries, and books (Schiavi, l.c. p. 506). A trade of special importance, against which ineffectual prohibitions were several times issued, was that in precious stones; the sovereigns of Europe were the first to employ Jews for selling, buying, and exchanging gems (ib.). Jews were prominent also in engineering. In 1444 a decree of the Senate called "a certain Solomon, a Hebrew by race, to be present at conferences concerning the diversion of the Brenta, because he has great fame for skill in matters concerning water" (Zendrini, "Memorie dello Stato Antico e Moderno delle Lagune di Venezia," i. 102, Padua, 1811). Title-Page of a Ritual Used by the Jewish Community of Tripoli, Printed at Venice 1680. In 1490 an engineer, wishing to associate himself with some Jews in the mounting of a machine whichhe had invented, asked the Senate whether the laws concerning the granting of privileges to inventors were applicable to Jews as well as to others. To this the Senate replied that in such matters no distinction was made between Venetians and foreigners, between Jews and Christians (Romanin, l.c. v. 337, note C). One Ẓarfati, in the second half of the sixteenth century, invented certain improvements in the methods of silk-weaving, and his studies were published at Rome and obtained for him a privilege from Pope Sixtus V. (Schiavi, l.c. p. 504). In 1630 a certain Naḥman Judah obtained permission to manufacture cinnabar, sublimate, and similar compounds, on condition that the business should be carried on under the name of a Christian (Schiavi, l.c. p. 505). In 1718 another Ẓarfati was permitted to manufacture not only cinnabar and sublimate, but also aqua fortis, white lead, minium, etc. (ib.). Under the restrictions placed upon them Jews could not contribute much to general literature; mention must be made nevertheless of the grammarian Elijah Levita, who spent a great part of his life in Venice (Ravà, l.c. 1871, p. 335; Grätz, l.c. ix. 225). Noteworthy also were the two rabbis already mentioned, Leon of Modena (1579-1649), at whose sermons even nobles and ecclesiastics were present, and Simeon (Simḥah) Luzzatto (1590-1663), who, besides the "Discorso," wrote "Socrate, Ossia dell' Intendimento Humano," which he dedicated to the doge and Senate. Reference should also be made to the poetess Sara Copia Sullam (1592-1641), who was regarded by several critics after her death as one of the most illustrious writers of verse in Italy (Soave, l.c. 1876, p. 198). Other authors of this period who usually wrote only in Hebrew were: David Nieto (1654-1728), author of the "Maṭṭeh Dan"; Moses Gentili (d. 1711), author of "Meleket Maḥshabot"; his son Gershon (d. 1717, at the age of seventeen), author of the "Yad Ḥaruzim"; Rabbi Simeon Judah Perez; and Jacob Saraval (d. 1782). Among the physicians of the republican period the most distinguished were Jacob Mantino (1490-1549), a native of Tortosa, who was directed by circumstances to Venice, and who became chief physician to Pope Paul III. ; and Giuseppe Tamari, who held the office of city physician (Ravà, l.c. 1871, p. 334). One of the conditions always imposed upon the Jews of Venice was that of keeping banks for lending money; and to insure their continuance the "condotta" of 1534 placed this obligation upon the Università as a body. Although these banks at first satisfied the requirements of the citizens and were at the same time a source of gain to those who kept them, they finally ended in a great financial disaster. The community, which formerly had been very rich, declined rapidly during and after the war with the Turks over the island of Candia (1645-55), the cause being the enormous burdens laid upon it by the expenses of the war. Many emigrated to escape these burdens; the plague of 1630, with the consequent stagnation of business, drove others out; and bad administration was responsible for other departures; so that in order to fulfil its obligations the community was forced to sink deeper and deeper into debt, which finally reached the sum of nearly a million ducats. As soon as the government saw the peril of an institution which was considered a necessity to the state, it endeavored to remedy the evil by adopting more easy terms of payment and by making other arrangements within its power; but when all other methods had proved insufficient it was compelled finally to proclaim the Università a private corporation to enable it legally to announce its insolvency. In 1735 the Università suspended payments, and a compromise was effected with its creditors with the support and protection of the government. The banks continued to exist, however, even after the fall of the republic, and until 1806, when they were closed by an imperial decree. On that occasion the Jews gave the commune all the money and property in the banks, having a total value of 13,000 ducats, to be devoted solely to charity. The municipality publicly expressed its gratitude for this gift ("Gazetta di Venezia," Oct. 6, 1806). The Università seems soon to have recovered from its failure; for in 1776, on the expiration of one of the "condotte," certain commercial restrictions were proposed as a check upon the excessive influence which the Jews had acquired. These proposals gave rise to many heated discussions. The majority sided with the Jews, and called attention to the fact that several Jewish families had acquired large fortunes by their thrift and were of service to industry, besides giving employment to many of the poor. The assistance they had rendered to the state was also called to mind, special emphasis being laid upon the noble conduct of Treves, who had loaned the treasury without interest the money necessary for the execution of the treaty of Barbary. After a long debate, however, the passions and influence of a few powerful reactionaries prevailed, and the proposals became law (Romanin, l.c. viii. 212). Several years then passed without incident, when the republic, becoming involved in difficulties with Napoleon, reconstituted itself as a democracy. In consequence all citizens were declared equal in the eyes of the law, and all legal discriminations against the Jews became null and void. Each strove to outdo the other in demonstrating his fraternity, and on July 11, 1797, amid great popular rejoicing, the gates of the ghetto were torn down and its name changed to "Contrada dall' Unione" (= "Street of Union"). Many speeches of lofty tone were made on this occasion, and even priests were present at the ceremony, setting the example in evidencing the feeling of fraternity, for which they were praised by the new municipality. The latter had been quickly constituted, and three Jews had at once taken their places in it (Romanin, l.c. x. 222). Yet even this revolution, though made in the spirit demanded by the times, could not save the republic, which was powerless before the invading armies of France. In the very month in which this change of government took place Napoleon declared war on Venice, and the Senate, wishing at least to make an attempt at resistance, invited the Jews and the various religious corporations of the city to contribute all the available silver in their places of worship for the defense of the city against the impending attack. The Jews enthusiastically responded,among the first, to this appeal; and again they received from the Senate a gratifying letter of thanks (Soave, l.c. 1876, p. 38). The attack, however, was never delivered; for the Senate abandoned the republic on Oct. 17, 1797, and Austria and France signed the treaty of Campo Formio, by which the city was assigned to Austria. The latter took possession of it at once (Jan. 15, 1798), and the Jews by this change of government lost their civil equality. They regained it, however, in 1805, when the city became a part of Italy, but lost it once more in 1814, when, on the fall of Napoleon, the city again came under Austrian control. When the news of the revolution at Vienna reached Venice in 1848 the city seized the opportunity to revolt, and, almost without bloodshed, forced the Austrian garrison to capitulate (March 22, 1848). It then proclaimed anew the republic of Saint Mark and elected a provisional government, of which two Jews formed a part — Isaaco Pesaro Maurogonato (appointed to the Ministry of Finance) and Leone Pincherle. Austria, however, reconquered the territory and held it until 1866, when it became part of the united kingdom of Italy; from that time the complete equality of Jews and Christians has been firmly established, as in all other parts of the country. According to the last census, the Jewish community of Venice numbers 2,000; and it now bears the name of the Jewish Fraternity of Religion and Philanthropy. It possesses many institutions for study and benevolence, and is one of the most cultured Jewish communities in Italy. Among the Venetians of most recent times who have become distinguished are: Samuel Romanin, the learned historian of Venice, in whose honor a bust was placed in the Pantheon of Venice; I. P. Maurogonato, already mentioned, who for many years was vice-president of the Chamber of Deputies; Luigi Luzzatti, who was repeatedly minister of the treasury; the Treves dei Bonfili family, whose members still continue, as in the time of the republic, to be distinguished for their philanthropy and for their services to their fellow citizens; the poetess Eugenia Pavia Gentilomo Fortis; the physicians Namias and Asson; and the rabbi Abramo Lattes. In the industrial field also the Venetian Jews are well represented, being interested in many of the numerous factories and establishments on the islands around Venice, either as proprietors or as managers. Leon of Modena, Historia dei Riti Ebraici, Paris, 1637.